﻿ H.G. 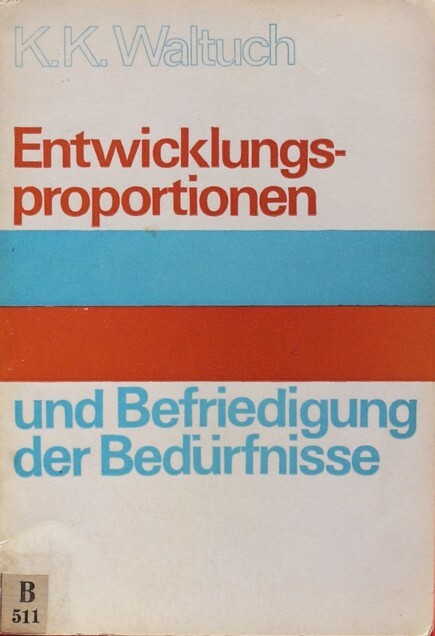 de Wolff - Entwicklungsproportionen und Befriedigung der Bedürfnisse"
Entwicklungsproportionen und Befriedigung der Bedürfnisse is the second book from the former Leninist bloc, which is reviewed on this portal1. The writer of this book is the Russian economist K.K. Valtukh (in the German language Waltuch). Due to the peculiarities of the Leninist culture it is difficult to judge this type of publications. In order to clarify the dilemma, it is helpful to first contemplate some comments of A. Aganbegian, a colleague of Val'tukh. They are taken from his book De toekomst van de Perestroika2. Aganbegian describes how under the Stalinist regime in the thirties and forties of the last century the Russian science was almost wiped out by the perpetuating ideological purges. Famous Russian economists such as Bukharin, Kondratiev, Preobrazhenzky en Tziaianov were simply liquidated. At the same time all sorts of pseudo scientists were installed, who were instructed to propagate the Leninist ideology, and to stifle deviating opinions. This terror ended only in 1953, when Stalin died, and was succeeded by Khrushchev. Then the dictature was supplemented by a limited form of democracy. Obviously in the mean time the Soviet science had fallen to a miserable level. Unfortunately twenty years of cruel repression can not be simply undone, and perhaps Khrushchev did not even desire this. Moreover even in the sixties the pseudo scientists remained active and guarded the dominance of the Leninist dogma3. It is true that economists with deviating opinions were no longer sent to the penal camps, but they did lose their academic privileges. Besides, the contacts with the western science remained frugal, so that the Russian science did not make up arrears. Still now and then a Leninist talent emerged, and excelled due to his own strength. For instance, Leonid Kantorovich was rewarded with the Nobel price for economics. Each Leninist economist wass obliged to found his arguments with citations of V.I. Ulianov (Lenin), if necessary supplemented with those of Marx and Engels. Even though nowadays this looks bizarre, it does not prove a poor quality. Still worse was the habit to keep out mathematics for many decades, because economics was supposed to be a qualitative, ideological science. The use of mathematics would indicate an affinity with the bourgeois enemy. Only in the second part of the sixties the application of mathematics was condoned. The reader can imagine what such an atmosphere does with the quality of science, and with the people that work there. Or perhaps not4. Against this background it must now be assessed whether the ideas of Valtukh in Entwicklungsproportionen und Befriedigung der Bedürfnisse are valuable. Indeed measured by the Leninist standard he engages in a revolutionary approach, since he employs utility functions. The concept of utility originates from the neoclassical theory, which was still seen as hostile in the ideological sense. For she explains the economy by means of subjective preferences, whereas Leninism adheres to the objective historical development. For Leninists the idea of the isolated individual is a taboo. But Valtukh also attacks the neoclassical theory. For he assumes that at a given time there are historically determined preferences. The utility is bounded by social minimum and maximum values. On the one hand, nobody must live below the subsistence minimum, and on the other hand the preferences are limited in the upward direction by the human inability to imagine future prosperity. Especially this maximum conflicts with the neoclassical idea, that all present-day and future goods are known and can be evaluated. Only in the last decades the notion rises, that the human imagination is always bounded. This causes the phenomenon of the preference drift. For instance, when the individual wealth increases, then soon new preferences emerge. New possibilities are seen, which were previously unsuspected, and they cause dissatisfaction. It is meritorious that forty years ago Valtukh called attention to this misconception of the neoclassical model. Completely informed individuals are a caricature. The reality consists to a significant degree of distorted expectations and of a dynamic social tension. Furthermore, the consumption is a driving force towards new needs. The people develop their own life style. Indeed wealth increases the satisfaction, but less than the neoclassical theory suggests. In this regard Valtukh adheres to the sociological theories of the mass consumption in the twentieth century (although the book does not contain any references to Durkheim, Weber, Simmel, Veblen or Maslow5). Entwicklungsproportionen und Befriedigung der Bedürfnisse contains the well-known sociological topics, such as the division of labour and the social differentiation. Needs that are luxury in the present are the forerunners of the future way of life (Simmel). Valtukh calls this the perspective needs, which shift towards services. He disapproves of calculations with individual utility functions, but endorses a central utility function, which must be determined by a planning agency. The central planning agency develops the perspective, and anticipates on the yet dormant needs. The plan takes into account the composition of the population, that is to say, there is a differentiation with respect to groups. Just like Toms and Van Praag, Valtukh also classifies the goods according to functional categories (based on a characteristic or quality). Subsequently Valtukh presents an elegant method for the calculation of the indifference curves. The perspective can be realized by a continuous expansion of the resources. The ambitions of the perspective can rise with the progression of time. Apparently the optimal growth path is dynamic. Valtukh insists on more market research in the Leninist planned economies. This is the only way for the planning agency to obtain information about the preferences of the people. Besides, the people can be guided by means of advertising6. Valtukh argues that the planning agency has more knowledge than the individuals, and therefore its expectations are extremely rational. The utility function of the planning agency is fairly reliable and objective. And the plan can correct the existing social disproportions in the consumption, in accordance with the general interest. For this purpose all kinds of norms are developed. Valtukh has actually done realistic calculations with his utility- or target-function, albeit for only nine economic branches, and he presents his results. They show that structural changes are necessary. Finally Valtukh recommends again the application of utility calculations, which have been a taboo in Leninism for such a long time. He describes how the Leninist economists still have a difficulty in distinghuishing between the exchange value (production costs) and the social use value. Here an additional problem is that the product prices themselves are determined in the plan. Even though the western reader is surprised by the peculiar Leninist approach, Entwicklungsproportionen und Befriedigung der Bedürfnisse does present a well-considered and original theory. Valtukh argues in a convincing way in favour of the central utility function and of central planning. Indeed it was not clear from the start that the planned economy would lose the system race with capitalism, even in East-Germany, where the conditions for planning were quite favourable7. In some branches planning may still be superior to competitive markets. Besides, it has already been said, the book draws the attention to several deficiencies in the neoclassical utility theory. Also this aspect adds to its merits and value. An English edition may be worthwhile.